This book brings Python to life and brings you (and your parents) into the world of programming. The ever-patient Jason R. Briggs will guide you through the basics as you experiment with unique (and often hilarious) example programs that feature ravenous monsters, secret agents, thieving ravens, and more. New terms are defined; code is colored, dissected, and explained; and quirky, full-color illustrations keep things on the lighter side. Chapters end with programming puzzles designed to stretch your brain and strengthen your understanding. By the end of the book you’ll have programmed two complete games: a clone of the famous Pong and "Mr. Stick Man Races for the Exit"—a platform game with jumps, animation, and much more. Jason R. Briggs has been a programmer since the age of eight, when he first learned BASIC on a Radio Shack TRS-80. Since then he has written software professionally as a developer and systems architect and served as Contributing Editor for Java Developer's Journal. His articles have appeared in JavaWorld, ONJava and ONLamp. 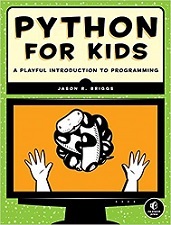 Python for Kids is his first book.